The housing is made of compression molded fiber reinforced polyester composite. The color impregnated SR2 composite will not flake or peal. Multiple ring/guard assemblies are available for a customizable trim finish. 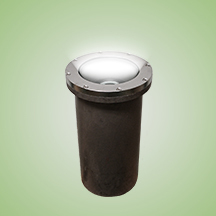 Flood and spot reflectors are available for HID E17 lamps. The fixture can accomodate reflector shaped lamps for specific beam patterns. Convex and walk over lenses are both available. The fixture can be used with up to 75W Par30 Incandescent, 50W Mercury Vapor, 50W Metal Halide, 50W High Pressure Sodium, or 32W Compact Fluorescent lamp/ballast systems. All ballast trays are thermally protected and come pre-wired to specific line voltages via quick connects. Pre-installed 15’ and 30’ power cords are available from the factory. The TDB2W Well Light is an in-ground fixture and should be installed with back fill according to the Techlight TDB installation instructions. A ½” conduit entry is supplied into the anti-siphon chamber of the housing.